Atomic tables have a different foosball man design that was recently invented and can only be found on the their 2 foosball table models. This innovative design has adapted the traditional foosball men with a toe and a head with a 2 feet design called a "hammerhead". This allows the men to be counterbalanced and also opens up the door to some interesting new ball control skills and tricks. 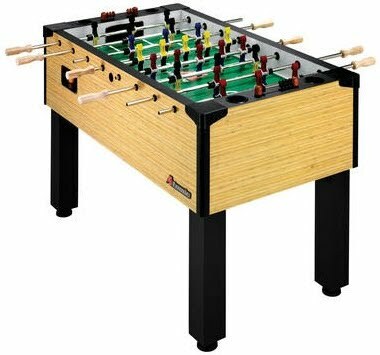 The AS1 foosball table is the lower-end of the two tables that Atomic manufacturers with a lighter and less sturdy cabinet design. Though the Atomic tables offer a unique game play, we recommend purchasing a Tornado table because the Atomic foosball men are not approved for tournament play.